View the complete online gallery of Fine Art Prints! Current fine art print discounts. Sample contemporary "Fine Art Print - 'The Golden Hind'"
The Golden Hind (or Golden Hinde - hind means doe), originally named Pelican, was an English galleon captained by Sir Francis Drake, in which he circumnavigated the globe. 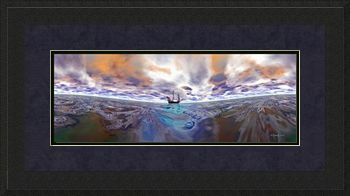 This panoramic marine art shows the ship in the distance, with the moon behind it peeking through the clouds. Several art print sizes are available. Are you an artist or a parent with children that like to paint or draw? Not all art materials are safe to use! Please review "Art Materials Safety", a broad-brush article on the safety issues involved with using artist supplies, authenticated by the former Chair of the ASTM Subcommittee D01.57 on Artist Paints and Related Materials. Giclee - search by color or genre. Art Prints - search by subject. Giclee Prints blog; please consider signing up for the RSS feed. All artwork has a satisfaction guarantee provided by the printer/framer. Online Gallery of giclee prints, my artwork and many other fine artists. 3D Stereograms; 3D Art Giclees featuring "Inner Secrets #1"
Digital Art featuring "The Golden Hind"
Fine Art Prints featuring "Smooth Moves"
Fine Art Prints, Giclees featuring "Crystal Shores"
Giclee Art featuring "The Coasters" & "A Little Splash of Color"
Giclee Prints featuring "Gooey Chocolate Caramel Nougat #1"
Mosaic Art featuring "Rhino Ruminations"
Open Edition Giclee featuring "Scorpio" & "Touché Macramé"
Organic Art Giclees featuring "Red Planet"
Original Art Giclees featuring "Shellfish Dream"
Original Giclee Art Prints featuring Flowers for M'Lady"
Pixelated Palette featuring "Sinuosity #1"
Sculptural Giclee Art Prints featuring "Enlightenment #1"
Stereogram Giclees featuring "Inner Secrets #2"
Stereograms; Sterograms featuring "Inner Secrets #1"
All artwork on this site is Copyright 2007 2008 Edward Kinnally. All rights reserved.